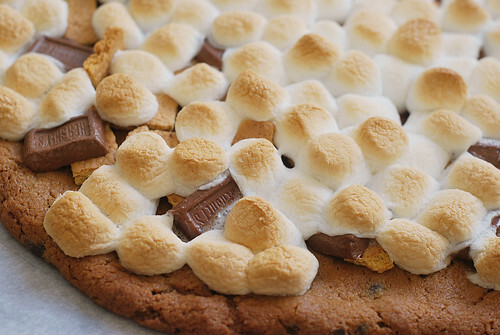 Happy 3rd day of #SmoresWeek! Except really, they’re all my favorite. I can’t choose. You can’t make me. But I really, really, really like this one. I used to think so, too, and then I tried one. It’s a hot chocolate. But frozen. And it will change your life. 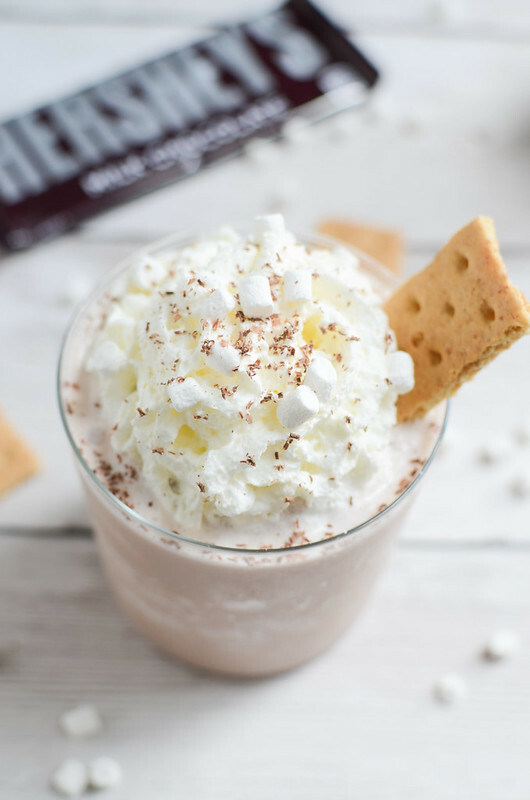 My original Frozen Hot Chocolate recipe is one of my most popular blog posts of all time and I knew I needed to transform it for s’mores week. And why mess with a great recipe too much? 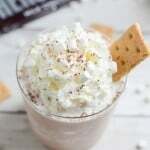 So I used that exact recipe to create this S’mores Frozen Hot Chocolate but I added in some marshmallow sauce! So it’s like a hot chocolate and marshmallow milkshake! I didn’t want to risk weird graham cracker chunks so I just popped a piece of one on top of the shake. You could also crumble some on top of the whipped cream if that’s your thing. Seriously, if you haven’t had frozen hot chocolate yet, try it this weekend! 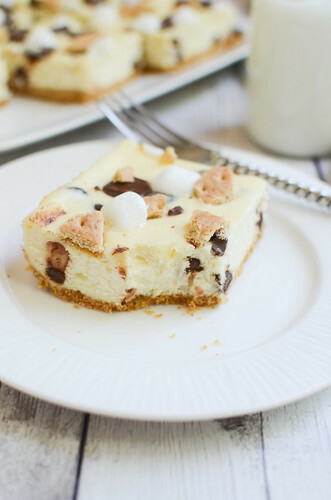 Nicole made a S’mores Icebox Cake! 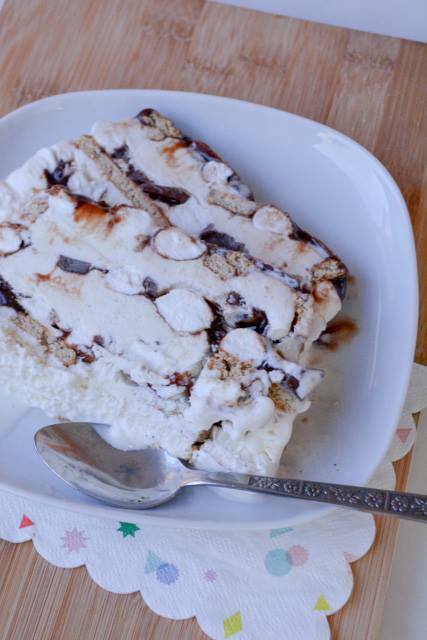 I love an icebox cake so much! 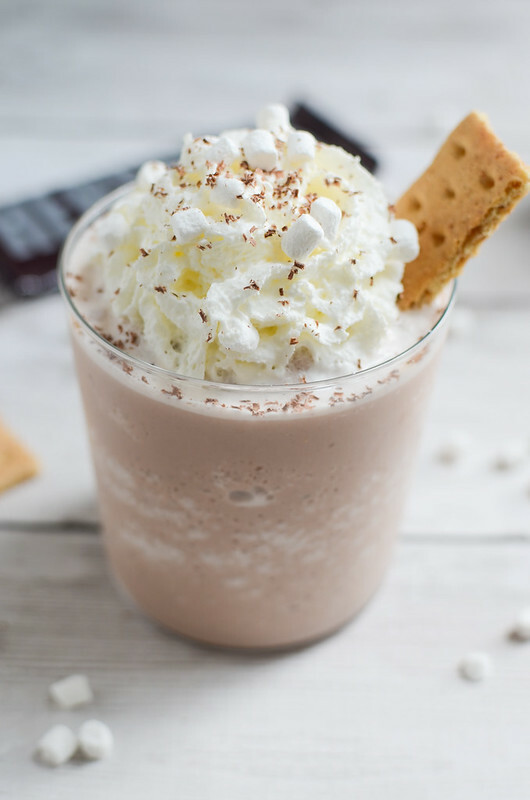 Make this to go with your S’mores Frozen Hot Chocolate this weekend! Combine milk, hot chocolate mix, marshmallow sauce, and ice in a blender and blend until smooth. Pour into a glass and top with whipped cream. Use a microplane to shave chocolate on top of the whipped cream and sprinkle with marshmallow bits. 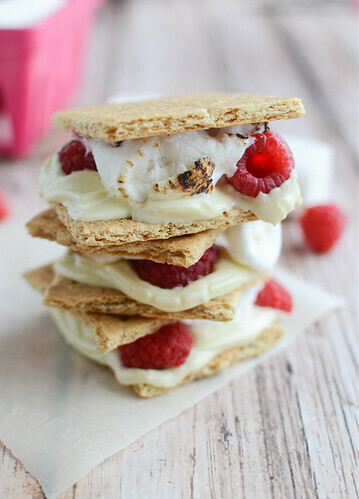 Top with graham cracker. 2 Responses to "S’mores Frozen Hot Chocolate"
It looks amazing. 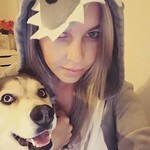 I just pinned it. Wasn’t nearly as good as I had hoped. Not saying bad, it just wasn’t superlatively great. I was disappointed. The top was the best part where I got whipped cream, tiny marshmallows, tiny chocolates and some graham cracker along with a swallow of the beverage. The beverage was thin and the marshmallow creme didn’t incorporate really well. The gobs were tasty though. I’ll probably try again with a few tweaks. It’s a great idea.